FORT LEE, Va. (Oct. 15, 2012) — Twenty-four of the Army’s finest warriors converged here Sunday to engage in a fast-paced and intense battle against themselves and each other as participants of the premier Soldier skills competition. The event, officially called the Department of the Army Soldier and Noncommissioned Officer of the Year Best Warrior Competition, known as Best Warrior, or BWC for short, brings together 12 Noncommissioned Officer, or NCOs, and 12 junior Soldiers from the Army’s major commands to demonstrate their proficiencies in skills critical to the success of every Soldier. Best Warrior events include a physical training test, a board appearance, land navigation and a number of tasks deemed essential for survival on the battlefield, such as casualty evaluation and weapons marksmanship. Fort Lee has hosted the event nine of the 11 years it has been held. Command Sgt. Maj. James K. Sims, acting command sergeant major, Combined Arms Support Command, and the installation’s ranking Best Warrior official, said the post always looks forward to the competition. The Sergeant Major of the Army oversees Best Warrior. In his second year as the noncommissioned officer in charge, Sgt. Maj. of the Army Raymond F. Chandler III has directed a number of changes intended to strengthen the event. First, it has been shortened from five to four days. Secondly, the traditional order of events have been rearranged in an effort to make it more intense, said Sgt. 1st Class Randall Reed, the Fort Lee Best Warrior planning cell NCO in charge. “It will be a high-paced competition that will challenge and surprise the competitors with events we haven’t seen in previous years,” he said during the planning phases of the event. Reed, holding true to tradition, did not disclose any of the specific changes. The chronological order of events in past competitions were the APFT, a board appearance, urban orienteering, Warrior Tasks and Battle Drills and a Mystery Event — a part of the competition unknown to competitors. Reed was at liberty to say that the board appearance will be moved from the first day of competition to the last. Chandler, welcoming the warriors at a Sunday evening social, conveyed to the Soldiers they are a select group whose achievements are distinguished. Soldiers who participate in Best Warrior are typically winners of battalion and brigade-level Best Warrior competitions before moving up to the major command-level. Some of these competitions begin roughly one year in advance of DA’s Best Warrior. Spc. 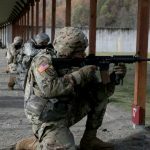 James Conklin, representing the Army Materiel Command in the Soldier of the Year category, said preparations leading up to Best Warrior can be difficult. Conklin said he exercised two to three hours per day, ran five to eight miles, lifted weights, ruck marched with more than 100 pounds of gear, trained at the weapons range and practiced land navigation among other training activities to ready himself for Best Warrior. Staff Sgt. Randy D. Roscoe of Fort Huachuca, Ariz., will represent the Installation Management Command in the Noncommissioned Officer of the Year category. He said he has also trained hard and thorough but said it is difficult to pinpoint exactly what to train on and said he didn’t want to be too predictive about what could be expected. While Best Warrior is a contest, it is also one of the most extensive and intense training opportunities afforded any Soldier. Sgt. Brandon Kitchen, a rare returning Best Warrior who competed last year, said no matter how hard you train, Best Warrior will test your physical and mental limits. The Soldiers who best dealt with the stress in last year’s competition were Sgt. Guy Mellor of the Army National Guard and Spc. Thomas Hauser of the U.S. Army Forces Command, the Noncommissioned Officer of the Year and the Soldier of the Year, respectively. The winners are traditionally awarded an abundance of gifts from sponsors and supporting organizations. Additionally, they embark on a tour of media interviews and personal appearances in support of the Army. The competition continues through Thursday, and the winners are scheduled to be announced at the Sergeant Major of the Army Awards Luncheon of the AUSA Annual Meeting and Exposition, Oct. 22, in Washington, D.C.